nutrition and food safety and world hunger. 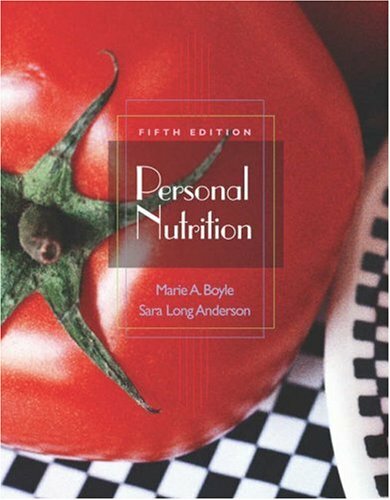 Each chapter in this text relates nutrition science directly to the students so they can understand and apply the information to their own lives. The Savvy Diner: But I Can't Afford to Eat Nutritious or Healthy Foods! Nutrition Action: Good and Fast: A Guide to Eating on the Run, or Has Your Waistline Been Supersized? Spotlight: How Do You Tell If It's Nutrition Fact or Nutrition Fiction? Nutrition Action: Oh Nuts! You Mean Fat Can Be Healthy? The Trans Fatty Acid Controversy--Is Butter Better? The Savvy Diner: What Is a Drink? What Is a Healthful Weight? Nutrition Action: Nutrition and Fitness: Forever Young, or You're Not Going to Take Aging Lying Down, Are You? Spotlight: Athletes and Supplements--Help or Hype? Nutrition Action: Should You Buy Organically Grown Produce and Meats?